Plenty has been written about Jen's Voigt's successful attempt at the new UCI hour record, set under the recently revised rules which permits the same bike set up currently used for the individual pursuit. I thought I'd just add a chart to illustrate what sort of power and aerodynamic drag would be required to attain the result Jens achieved. The chart below summarises these key numbers and plots the CdA v power required, and shows the ratios of power to coefficient of drag area and power to body mass. Where on that line Jens was, I don't know exactly, but it will be somewhere along there, or nearby. Click on the chart to open a larger version so you can see the numbers. Let me add some detail as to how the chart is derived, the assumptions used and key sensitivities. First the numbers we know. Jen's official distance for the hour was 51.115km, which is calculated by the number of whole and partial laps completed x 250m per lap. Now we know from video that Jens did not always ride a perfect line around the track, and so his wheels actually travelled further than the official distance. Riding a good line is all part of the skill of track racing, so Jens likely cost himself some official distance. 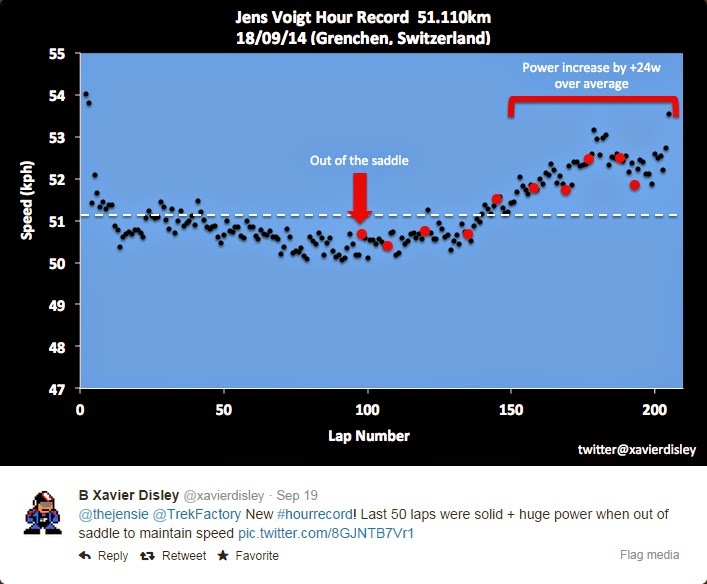 So when calculating what speed Jens was actually doing, we'd need to know his actual wheel speed or distance per lap. However since air resistance acts mostly on where the centre of mass of the bike and rider is, which on a velodrome travels a distance less than that of the wheels, then we'd also need to factor in the lean angle of the bike and rider. Now I'm not going to attempt to do that. The data does actually exist as it was recorded by the Alphamantis Track Aero System which performs such calculations on the fly, but I don't have it. In any case, I am going to assume that the extra distance travelled by Jens' wheels was cancelled out by the lean angle meaning Jens' centre of mass travelled about the same as the officially recorded distance. It's difficult without more data to be more precise than that, but it's a reasonable assumption. Complicating the speed equation was Jens' pacing, which was somewhat variable, starting strongly, falling into a lull and then increasing somewhat in the final 10-15 minutes of the ride. So there would have been quite some variations in the power output during the ride. Of course the event starts from a an electronic gate that holds the rider, and there is some extra effort require to get up to speed which takes 10-15 seconds, so while it's a factor, it's a pretty small one in the the overall hour. In any case, I am going to work with the overall average speed of the rider as 51.115km/h. Outdoors there was a light wind of 2-3km/h and no precipitation. A spectator at the track reported the temperature indoors was 26C. Outside it was 20C with a maximum of 23C, so the reported indoor temperature is plausible and I'll go with that. All of this provides an air density value of 1.114kg/m^3. Trek reported via social media Jens' body weight to be 76kg. It may have been a little more but it's not a number that is particular critical to the calculations, as this is all about power and air drag. Bike/kit mass - I'm going to assume ~ 8kg, again the calculations are not overly sensitive to this value. As an example of this insensitivity, changing rider's mass by 5% only introduces a 0.3% error into the W/m^2 calculations. I'm going to assume a coefficient of rolling resistance (Crr) of 0.0025, which is about typical for a quality set of track tyres on a quality wooden indoor velodrome. I did some calculations for Crr of 0.002 and 0.003, which is quite a broad range for such tracks and tyres and it only changes the power demand by approximately +/- 1.5%. This is because rolling resistance accounts for less than 10% of the total energy demand for the event. OK, so given all that, what power and aerodynamic numbers would be required to do what Jens did? Well we can't really know what power Jens averaged for the effort unless Trek release the data, but what we can say is what his power to air drag ratio was. To ride that speed, it would be in the range of 1715 to 1750 W/m^2. That's an average, as of course Jens' actual instantaneous CdA did vary as he changed position on the bike at times. He was mostly in his aero bars but was occasionally standing up on the pedals or making other adjustments. This chart shows the line along which Jens likely falls somewhere. If his power was lower, then his CdA must have also been lower in order to maintain power to drag ratio in the range of ~ 1715-1750 W/m^2. The chart also then shows what his power to body mass ratio would be (assuming 76kg), so we can see the wide range of power capability possible to attain such a speeds. You don't need big power, if you are very slippery through the air. 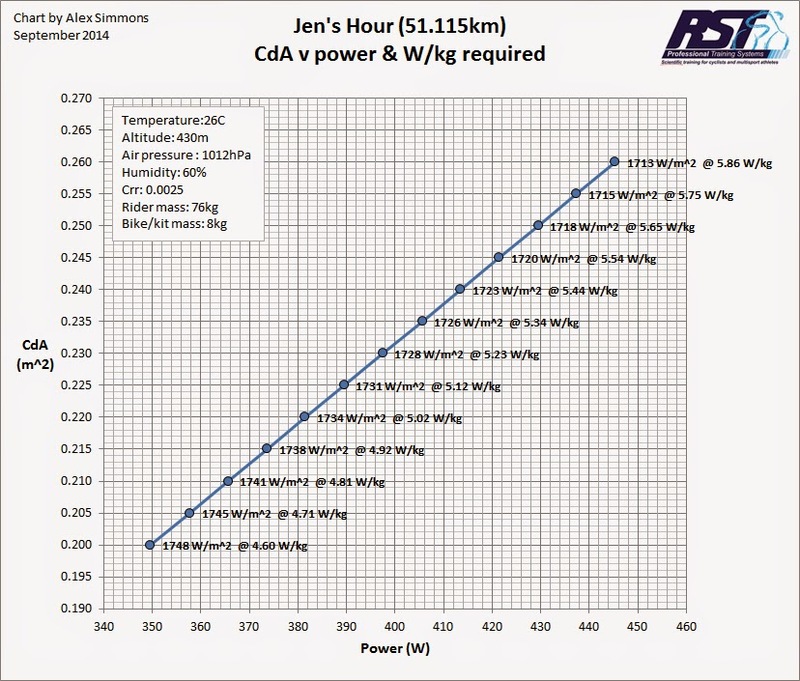 Great article Alex as you give a clear explanation of power requirements for Jens' world record. I saw that same notice on social media, but it was also suggested to me afterwards that the quoted average power of 412W was only for the latter part of the ride where he picked his pacing up somewhat.